A great south-facing wall that hosts a few 1-3 pitch climbs including the classic Sunblessed (5.10b). The approach is fairly long and strenuous and this keeps traffic down a bit. Follow the Backside Trail from the Chief campground until a sign directs you right for the Sqaw trail. Follow the Squaw trail until you reach the White Cliff. At this point you must head up the gully. Five minutes up the gully you should see a break in the right wall with a number of big downed trees. Pass this break and after another two minutes you'll see a smaller break in the right wall with a smooth log. Follow the faint trail up this break. Once through the break head up a faint trail that goes uphill until you emerge into a pleasant forest with a short wall on your right. A a little further and you'll emerge onto slabs marked with a few cairns. Follow the cairns until the trail (visible as a de-mossed line on the slab) re-enters the forest. At this point you are at the Solarium. 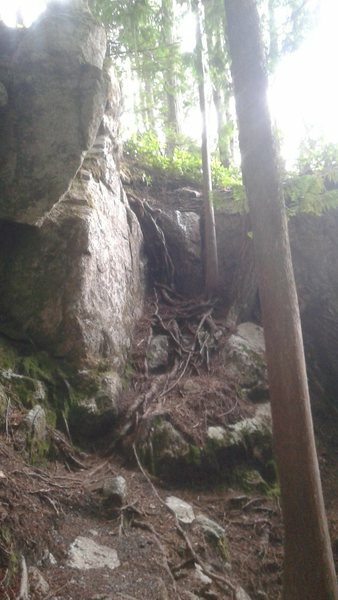 A trail runs along the base of the cliff. Sunblessed in particular is at the far end of the trail. Finding your way to the Solarium can be a challenge, so I've included here a picture of the exit from the 3rd Peak gully to the Solarium.